REGISTRATION FOR THIS EVENT IS NOW CLOSED, THANK YOU FOR YOUR INTEREST! 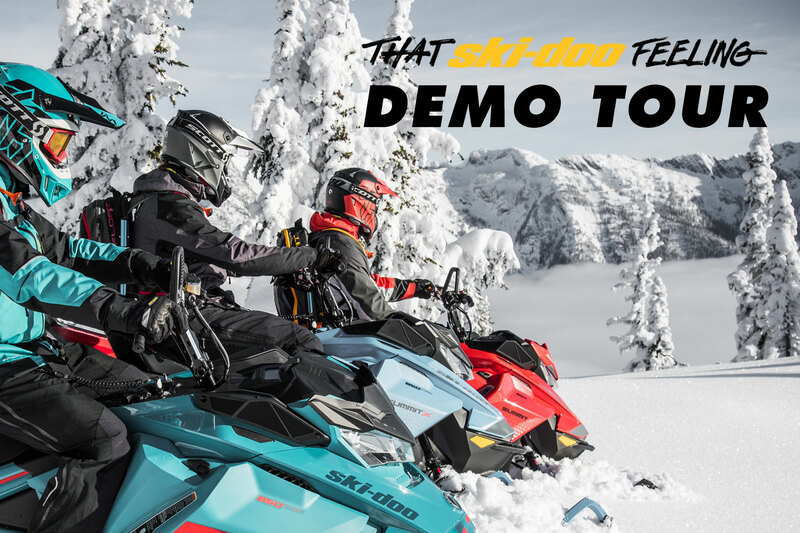 Please visit http://demo.ski-doo.com to see more demo rides near you! Subscribe to receive promotional e-mails from all BRP brands. We have received your registration. You should receive a confirmation email shortly. ©2018 BOMBARDIER RECREATIONAL PRODUCTS INC. (BRP). ALL RIGHTS RESERVED. ®, ™ AND THE BRP LOGO ARE TRADEMARKS OF BRP OR ITS AFFILIATES. † ALL OTHER TRADEMARKS ARE THE PROPERTY OF THEIR RESPECTIVE OWNERS. ALWAYS RIDE RESPONSIBLY AND SAFELY. FOLLOW ALL INSTRUCTIONAL AND SAFETY MATERIALS. ALWAYS OBSERVE APPLICABLE LOCAL LAWS AND REGULATIONS. ALWAYS WEAR A HELMET, EYE PROTECTION AND APPROPRIATE PROTECTIVE CLOTHING. AND ALWAYS REMEMBER THAT RIDING AND ALCOHOL/DRUGS DON’T MIX. BRP, PARTICIPATING DEALERS AND OTHER AFFILIATES MAY CONTACT ME ON ANY NUMBER I PROVIDE, WHETHER A MOBILE PHONE NUMBER OR A LAND LINE NUMBER, USING AUTOMATED TELEPHONE DIALING SYSTEMS, TEXT AND/OR PRE-RECORDED MESSAGES TO RESPOND TO MY REQUEST. BY COMPLETING A QUOTE FORM, I AM EXPRESSLY CONSENTING TO THESE METHODS OF CONTACT. I UNDERSTAND THAT CALLS AND MESSAGES TO ANY MOBILE PHONE NUMBER MAY INCUR ACCESS FEES FROM MY CELLULAR PROVIDER. I UNDERSTAND THAT CONSENT IS NOT REQUIRED AS A CONDITION OF THESE SERVICES. CALL US AT 1-844-311-8834 TO PROCESS A LEAD FORM WITHOUT CONSENTING TO THESE ACCELERATED NOTIFICATION PROCEDURES.